Though Tropical Storm Hermine brought strong winds and tornadoes to parts of Texas when it moved inland on September 7 and 8, the storm’s greatest hazard came from heavy rainfall. Hermine moved slowly, allowing rain-producing clouds to linger and rain to accumulate. The heavy rains triggered widespread flooding, including major flooding on the Trinity River in the Dallas region, said the National Weather Service. The storm’s path inland over Texas and into Oklahoma and Arkansas is clearly defined in this rainfall image. The image shows rainfall measurements from a variety of satellites, including NASA’s Tropical Rainfall Measuring Mission (TRMM) satellite. The TRMM-calibrated Multi-satellite Precipitation Analysis collated the measurements to estimate total rainfall between September 2 and September 8, 2010. The heaviest rain fell shortly after Hermine came ashore, but a swath of heavy rain also followed the storm north. NASA Earth Observatory image by Jesse Allen, using near-real-time data provided courtesy of TRMM Science Data and Information System at Goddard Space Flight Center. Caption by Holli Riebeek. Tropical Hermine’s track inland is defined by a trail of heavy rain in this rainfall map from September 2-8, 2010. Tropical Storm Hermine formed on September 5, 2010, in the extreme southwestern Gulf of Mexico. 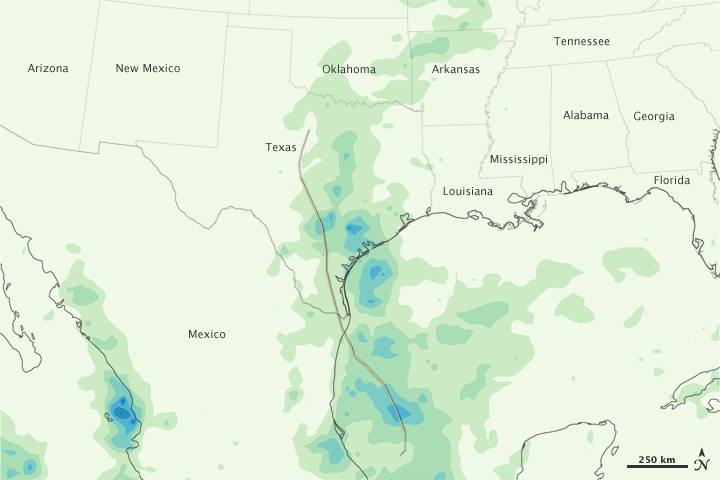 Though the storm never reached hurricane strength, it dumped extreme rain and caused flooding in Mexico, Texas, and the lower Midwestern U.S.
National Weather Service River Forecast Center, West Gulf RFC. (2010, September 8). Hydro-Meteorological Discussion. National Oceanic and Atmospheric Administration. Accessed September 10, 2010.